Sometimes, a five-year age difference can make a big difference. Most of the time, my husband and I remember a lot of the same things from childhood, ranging from the kinds of candy we found at the drug store to popular clothing styles. Although, things he remembers from high school, I remember from elementary school. Every once in a while, we find a TV show that was a big part of Pat’s youth was one I’d never heard of. Daniel Boone was one of those shows. While Pat watched every episode both in its debut and in re-run, I vaguely knew there was a show called Daniel Boone, but I had never actually seen it until I got hooked on retro TV a couple years ago. Watching Fess Parker battle bad guys on the American frontier felt nostalgic to me even though the show wasn’t part of my childhood. My brother and I used to play cowboys and indians as children and Daniel Boone with his coonskin cap was a pretty constant hero figuring into our games. This may have been fueled, in part, because of family lore. Daniel Boone apparently came through the region my family settled in a few generations ago. I remember having a newspaper article in my photo album (curtesy of my mother) that described the experience of my “aunt” Polly (I think she was really my great, great, great aunt Polly and long gone by the time I arrived on the scene) with whom Daniel Boone stayed for some period of time. I can’t look up the details anymore, but in my memory, Daniel Boone lived with her family for several months when she was a girl. For many years, I believed I was related to Daniel Boone. Who knows? Maybe I am. 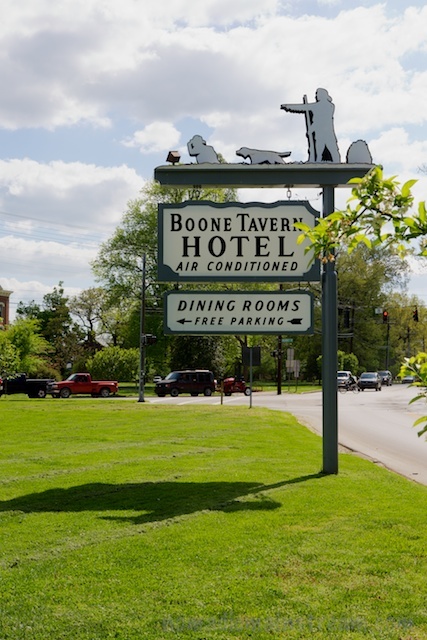 Whatever my relations, whenever I passed the exit sign on interstate 75 that says, “Historic Boone Tavern,” I always want to stop. On this trip home from Columbus, I decided it was time. 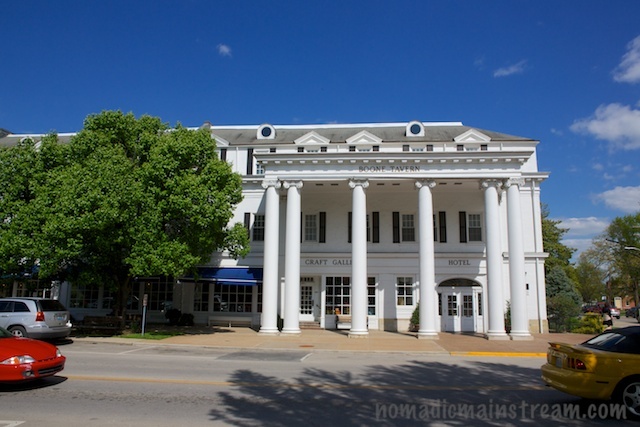 I was surprised to realize Boone Tavern is in Berea, Kentucky. This is the approximate halfway point between Columbus and Chattanooga and another place I’ve always wanted to stop. So, taking the opportunity to feed two hawks with one rat (as my friends at Save Our American Raptors would say), Tisen and I took another breather from the drive home in this small town. 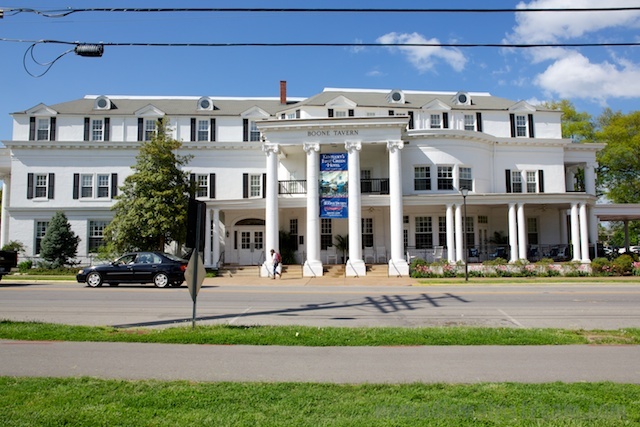 Boone Tavern is an operating hotel today. Apparently it is not kept in its original state–a sign proudly declared it’s air-conditioned. Tisen and I didn’t try to go in together and it was too hot to leave Tisen in the car, so we made a lap around downtown Berea, checking out Boone Tavern from two sides instead of sipping a cold adult beverage at the bar. Tisen was unimpressed by the view of the tavern. 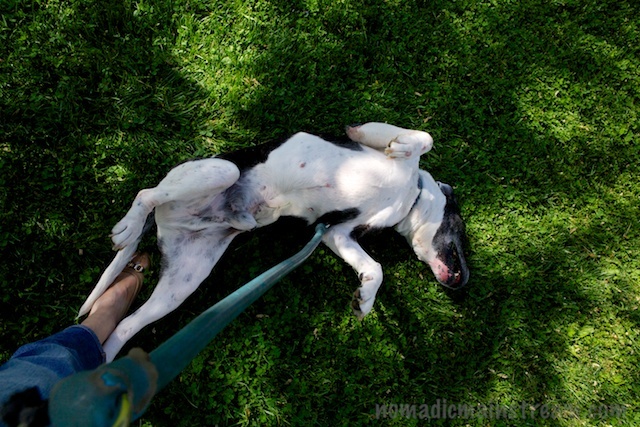 However, he did seem to take a special liking to the grass in the small park across the street from the tavern. 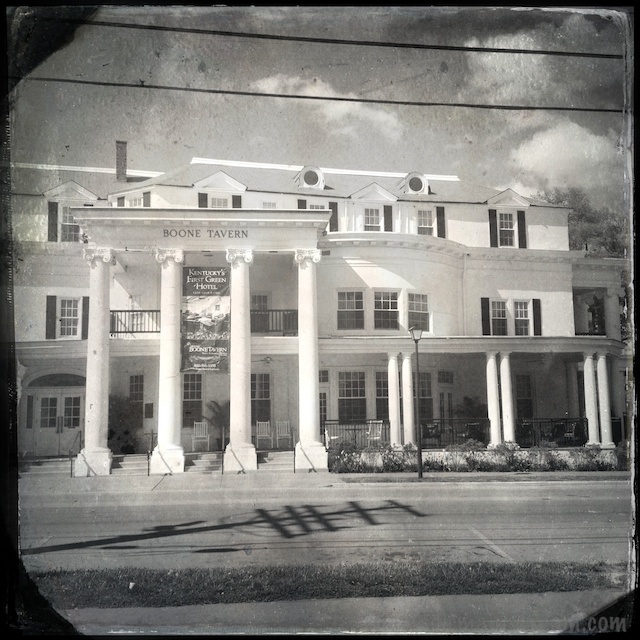 This entry was posted in Photography, Road Trip, Sight Seeing and tagged Berea Kentucky, Boone Tavern, Daniel Boone, Hipstamatic, landscape photography. Bookmark the permalink.